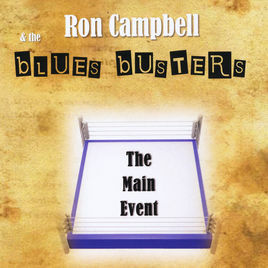 “The Main Event” is 16 original tracks from Canadian blues band Ron Campbell & the bLUES bUSTERS (http://ronc.net). Though perhaps little known internationally, the bLUESbUSTERS are hardly novices; in a career stretching back to the mid-'60s, they've honed their blues chops on a thousand smoky roadhouse stages and are the pride of their hometown, Powell River, Canada. Guitarist/songwriter Ron Campbell has charted on college radio, has written for film and stage, and has won several songwriting awards. Once described as “Canada's best-kept blues secret,” Ron Campbell & the bLUESbUSTERS have, with 'The Main Event,' become contenders.